Walk down the aisle of any flight lasting more than an hour, and you can probably guess what titles are topping the New York Times best-seller list with surprising accuracy. Airline passengers are highly vested in reading; and so are the airports they pass through. Newsstands placed strategically along the concourse sell everything from glossy lifestyle magazines and lighthearted beach novellas to informative local guidebooks and hardcover tomes about the latest business theories. But travelers also clutch tattered paperbacks brought from home as if they are precious cargo. These days, passengers don't just bury their noses in books and newspapers. More and more read on the glowing screens of Nooks, Kindles and other portable electronics. Airport officials are consequently connecting the dots between the recent explosion of e-reading and their in-terminal Wi-Fi service (or the continued pressure to provide free Internet access). Fort Lauderdale-Hollywood International Airport (FLL) in Florida was the first to offer passengers free downloads of e-books in 2011. In cooperation with the Broward County Libraries Division, FLL provides access to over 15,000 public domain titles - an enterprising way to offer reading material to travelers without a local library card. Fiction and non-fiction selections are available, and many of the books are classics for children and adults, notes Catherine McElrath, publication specialist II at the Broward County Libraries Division. Bestsellers are not offered, which helps mitigate competition with airport vendors. "The project was launched as a fun, free way to provide reading material to guests of the airport and Fort Lauderdale and to raise awareness of Broward County Library's electronic services," explains McElrath. McElrath credits FLL's public information officer, Greg Meyer, for providing the support to make the program happen. "[He] assisted in helping libraries get free public service space on their terminals," she notes. Once access was granted, Meyer also ensured that passengers knew about the program. The quick response codes used to access the program are displayed with the messaging on our television monitors in the baggage claim areas of all four terminals, notes Meyer. To date, airport visitors have scanned the codes 1,266 times. After FLL began offering free electronic reading material, a variety of other airports have followed suit. Cherry Capital Airport (TVC) in Traverse City, MI, calls its program Books on the Go. "It's a partnership we're very proud of," notes Susan Wilcox Olson, the media and marketing representative for the airport. "The downloads are quite popular in the summer months, when we have a lot of inbound vacation traffic." Last February, PHL unveiled its Virtual Library Hot Spot, a furnished area on the airport's busy D/E Connector terminal that provides passengers with free and unfettered access to over 35,000 e-books. The virtual spot also links them to nearly 1,200 author podcasts and megabytes of other digital content - all provided by the Free Library of Philadelphia. The partnership expands the reach of the Free Library, potentially extending its powerful electronic platform to nearly 30.5 million passengers who pass through PHL every year and nearly 20,000 employees who work there. "By merging technology, customer-focused vision and the Free Library's digital resources, we have partnered with the library to create a unique traveler experience at PHL," explains James Tyrrell, the airport's aviation deputy director. Roughly one year later, PHL staff is still working with the Free Library to expand awareness of the resources available at the in-airport Hot Spot. Currently, the most direct route to the library services provided at PHL is the airport's splash page. The Free Library also staffs the area with a digital resources specialist two days per week to assist visitors and airport employees accessing the library's services. "The Virtual Library is an airport initiative to help us achieve our goals to provide more innovative customer services and amenities to our passengers," says Tyrrell. "In the digital age, the Free Library of Philadelphia's resources have become more accessible, and the Virtual Library gives airport visitors the ability to download e-books, listen to podcasts and browse through the library's vast digital offerings in a comfortable setting." An existing space was outfitted with furniture collected from other areas of the airport, so costs to add the reading room were minimal, he notes. Accessing the e-material is designed to be fast and simple. When users log on for free Wi-Fi access, they are directed to PHL's homepage, where a splash page highlights links to free, downloadable material through the Free Library of Philadelphia. Since launching, the site averages about 5,000 page views per month. In addition to providing a unique new service for its own customers, PHL also inspired Boise Airport (BOI) to offer free downloads of reading material. The Idaho facility took PHL's hot spot concept one step further and brought a full digital branch of the local library into its terminal. "When I read about the virtual library at PHL, I knew it was a concept I wanted to bring to Boise," says BOI Airport Director Rebecca Hupp. 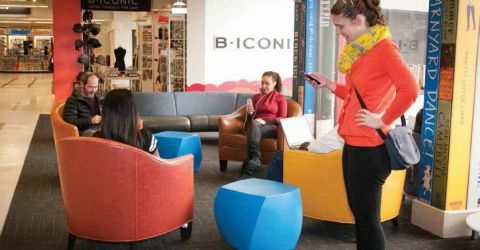 "The implementation of a digital library branch in the Boise Airport fit well into our overall plan of improving customer experience and providing travelers with a local sense of place." BOI opened a digital library branch on its busiest concourse last October. Located inside Gate 16 on Concourse B, the branch includes a reading area and six computers. Various library services are offered, including the ability to download books via the airport's free Wi-Fi. According to Hupp, it cost BOI less than $25,000 to partner with the Boise Public Library and add the new customer amenity. Funds for the project came out of the airport's existing budget. San Antonio International Airport (SAT) took yet another approach to offering free digital downloads by adding two stand-alone kiosks last October. Together, they cost $26,000 and were funded by Friends of the San Antonio Public Library. The airport has since installed a third kiosk. Each kiosk houses software that links travelers to the local library's digital collection; users simply plug in. Out-of-town travelers can sign up for a temporary library card at the kiosks or check out up to three books for seven days without a card. San Antonio Public Library cardholders can check material out for three weeks. At the end of the loan period, books automatically check themselves back in via a cloud-based system, so visitors don't have to return to the airport to return their reading materials. From October through January, visitors made 600 download requests, reports Nora Castro, the airport's public relations manager. E-books continue to be the most popular segment download. • A 2012 study by digEcor, a digital entertainment company, found reading to be the number one activity for passengers on flights from one to eight hours long. • Fully 97% of airline passengers carry a smartphone, laptop or tablet; 18% carry all three, according to the 2014 Passenger IT Trends Survey, by SITA and Air Transport World. • A study from the Pew Research Center found that reading on e-book devices and other portable electronics grew 13% between November 2012 and January 2014. Pew also found that after the 2014 holidays, 32% of U.S. adults owned e-readers such as Kindles and Nooks - up from 24% just four months prior. • Boingo Wireless reports that fully 29 of the 30 busiest U.S. airports now offer complimentary Wi-Fi - vs. just nine in 2007. On average, 28% of departing passengers use free Wi-Fi, but the range of passengers connecting varies widely (from 6% to 72%), due to differences in network quality and dwell time. Seattle-Tacoma International Airport (SEA) took a hybrid approach to its in-terminal library by offering free paperback books and magazines as well as free downloads; but the program ultimately proved unsustainable. Three "Quick Reads Shelves" were set up on SEA's Concourse A by the King County Library System's award-winning reading program, and visitors were encouraged to pick up free reading material for their flights. Between June and August of 2012, the program distributed more than 15,000 books, reports Julie Acteson, library system's community relations and marketing director. "It was a variety of genres for adults, magazines, and children's books - all donated from local organizations," she explains. In 2013, the library added an additional area on Concourse B, for a total of four Quick Reads Shelves at SEA. County librarians took turns staffing the airport spaces - helping travelers select reading material and re-stocking the shelves. Unfortunately, even with donated books, the cost of the program was difficult to maintain. The library system and its foundation spent $50,000 during one three-month period to support the unique initiative, Acteson details. Eventually, they discontinued the program. Although the growth of e-reading is unmistakable, the appeal of traditional printed material continues to endure. According to a 2014 study by the Pew Research Center, the percentage of U.S. adults who read an e-book in 2013 rose to 28%, from 23% the year before; but 69% of survey respondents had read at least one printed book during the same period. The study also found that the vast majority of e-readers also read printed books. "Though e-books are rising in popularity, print remains the foundation of Americans' reading habits," the report concluded. Manhattan Regional (MHK) knows that its passengers enjoy printed books, because visitors regularly pluck them off a shelf and carry them right out the front door. No, it's not a rampant case of shoplifting. The small Kansas airport doesn't have a gift shop. The books come from the local library, which collects them from area donors and then distributes them to MHK and six other wait-prone locations. Neither the airport nor the library expects passengers to return the books they take. "We just ask that they pass them along for someone else to enjoy," explains Judi Nechols, an adult services librarian in Manhattan. MHK calls its collection Books on the Fly, and passengers are grateful for the unexpected perk. "It seems to be very popular - especially when traffic is up during holidays or because of activity at Fort Riley (a nearby Army installation)," Nechols remarks. Typically, the library delivers 50 to 60 books per month, but personnel drop off extras if stock begins to dwindle sooner than usual. In March, MHK moved into a new terminal. Although the library shelf had not yet been relocated, airport personnel were certain it wouldn't be long before the books were unpacked, in place and attracting curious browsers.